How To Use Your Tool ! Tecleo aquí para la versión Española !! 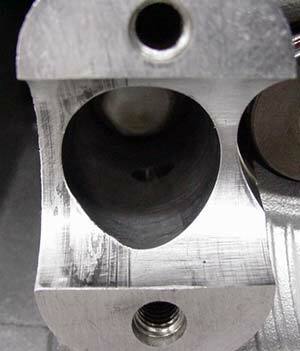 "Contrary to popular belief, piston rings don't seal the combustion pressure by spring tension. 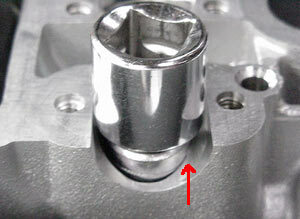 Ring tension is necessary only to "scrape" the oil as the piston goes back up the bore." Thanx for catching that mistake ... I've corrected the original version ! As for the break in method, I realize it goes "against the grain" and not everyone will agree with it. I've always felt that it's best to learn both sides of a story and then make your choice. Lots of people have commented to me that Mototune engines are really fast. This break in technique is one of the reasons why. What's wrong with this picture ??? 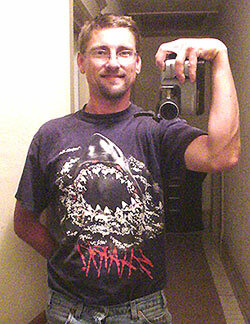 The tool he's using is touching the inside of the cam journal. Remember: Aluminum is Very Soft. 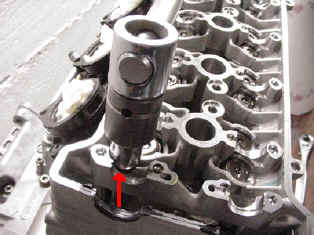 As he unbolts the cylinder head a very small burr is going to form where the tool contacts the edge of the cam journal. At this point, the burr is almost invisible. What's the big deal ??? 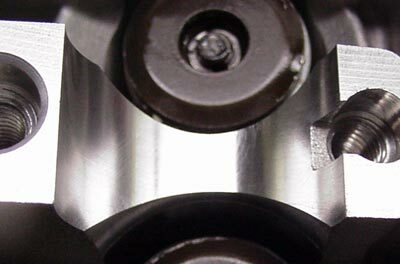 When the cam is installed, the burr takes up the oil clearance. 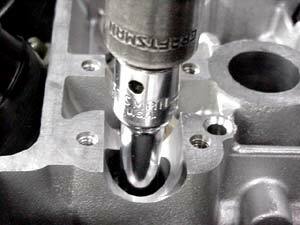 Once the engine is running, the camshaft will run very tight in the bore, causing the aluminum to gall all the way around the journal surface. The small burr went unnoticed, but the rider will definitely notice that his bike is slow !! Ironically, this common problem was caused while Wild Billy was trying* to make his engine faster. * When you try to do something... nothing happens. If you really want it to happen, you've got to do it. The solution is to use a longer extension. The part that passes near the cam journal is safely clear of contacting it. Once you realize how much power this problem costs, you'll start checking for burrs on every running surface of an engine ! This is how it should look. No burrs, no scores, no worries. Does Tool Size Matter ?? In This Case, Longer Is Better. Promote The Sport of Motorcycling!! Tell Your Friends About Power News !! !